Planning your trip to London. Tourist Tips. There’s one hell of a lot to do in London some basic planning will avoid unnecessary trapsing around on foot or irritating waiting for public transport. 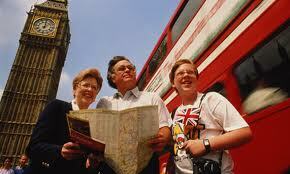 It’s best to plan a day out so as to maximise the number of things you can see – and to go for variety. Below are a few mornings, afternoons and whole days out we’ve arranged for visitors – time permitting, we can offer advice by Email (tourist@sightseeingtours.co.uk) if there’s anything you particularly want to see. Our Walks and itineraries link points of interest – see the separate page. Planning by length of stay – if you’re only in London for a day, a weekend or a week use our SHORT STAY pages where we show you how to cram as much into your days as possible. Weather – likely to make or break your visit. Although there are plenty of things to do in London in the rain, a week of low slate-grey skies and constant rain is not condusive to having a good time. The best season to come weatherwise is Late Summer or Autumn – latterly we’ve been having Indian Summers from mid-September to the end of October with clear blue skies and 20 degree temperatures. Eventually the weather breaks as the storm fronts move in off the Atlantic, then clears up for Christmas. February – April can be dire, and the heights of summer are very unpredictable. Consult the Meterological office here for facts and figures but beware predictions – they are so often wrong. When it’s raining there are plenty of museums and galleries to visit – and the tube system is generally very good outside of rush hour. What you’ll miss out on is strolling through London and seeing the many unique pleasures by the wayside. Click here to see when to visit London. Hotel Location Best to be near a tube station, buses can be slow and unreliable, and taxis expensive. The yellow circle line on the tube map marks the division between central and not-so-central London. Outside of that Zone your transport bill will rise – and once you’re in LT zone three, considerably. The best restaurants are in Islington, Soho/Chinatown and the south west of London which is where the life is. The City is a dead zone evenings and weekends. Hotel accommodation click here. Baker St tube, Madame Tussauds, walk north to Regent’s Park, the Zoo, then up Primrose Hill, Primrose Hill ‘village’ to Chalk Farm (or cut through Primrose gate by the zoo and along the canal towpath to Camden Lock) and Camden Market (weekends only), Camden Town tube, on a weekend. 4-5 hours. Train Waterloo – St Margarets, walk 10 mins to Marble Hill House, 5 mins to the foot ferry to, Ham House, walk 25 mins along river to Richmond, tube to Kew Gardens,& back to Waterloo – (can be heavy on the admission charges) Afternoon. Freemason’s Temple on Great Queen Street, 10 mins from the tube, Covent Garden market, Transport Museum in the Piazza, Backstage tour of Theatre Royal Drury Lane at the back of the transport museum, walk 10 mins to the Strand, the Law Courts and the Inns of Court. Three hours. Circuit round Covent Garden tube. Charing Cross tube, 5 mins walk to the National Gallery, Trafalgar Square, 5 mins walk down Whitehall to Horseguards, 10 Downing St and the Cabinet War rooms. 10 Mins across St James Park to St James’ Palace, Green Park tube. 3-4 hours. High St Kensington tube, 10 mins walk to Kensington Palace, Kensington Gardens, 15 minute walk to Notting Hill, 10 minute walk to Portobello Road market (Saturday – 3 hours) Notting Hill Gate tube. Queensway or Bayswater tube, hire Skates on Queensway, skate down to Albert Memorial, and thence to Kensington Palace and back to Queensway, exploring the park. Circuit. Oxford Circus tube, Oxford Street (west half of), St. Christopher’s Place, Wallace collection, Bond Street, Burlington Arcade, Royal Academy. Green park tube. Waterloo station/tube, London Eye, River walk, Oxo tower, Tate Modern, Shakespeare’s Globe, London Bridge station/tube. 3 hours. See also our walks section. Tower Hill DLR station/Bank tube, Island gardens DLR station, 10 minutes walk under the foot tunnel, Cutty Sark, Greenwich market, Naval Academy, 10 mins walk to the Queen’s House, Royal Observatory, 15 mins back to Greenwich Pier – boat back to Tower Hill – 4 hours. Mansion House tube, Mansion House, 10 mins walk to Guildhall Art gallery, walk round back of Guildhall up the walkways through the Barbican, Museum of London, 10 mins walk to St Paul’s Cathedral, St Paul’s tube. 4 hours. Virtually everyone flies into London, even if their reason to visit lies elsewhere. Booking a train trip from London to see the rest of the UK is best done AT LEAST TWO DAYS IN ADVANCE – very cheap fares are available, especially on Virgin Trains – as little as £9 return to Chester 2 weeks or more in advance. Outside of London the major places of interest (apart from those listed on our trips page) would be the Cotswolds (for which you need a car), North Wales: Snowdonia and the Castles (ditto), Oxford, Cambridge, Chester, York and Bath (easily accessible by train), and we’d recommend the North of Norfolk and the Yorkshire Dales (car needed). In Scotland, Edinburgh is the only city attraction – flights are very cheap on Easyjet (much cheaper than rail travel) if you book in advance. For scenery visit the Fort William area, but beware the midges in summer, and the weather in winter. Cornwall and the Devon coast are beautiful, but a long way from anywhere and quite tourist – you can fly there using the cheap internet airlines – cheap if you book enough in advance. No city except London merits more than one day. So many tourist boards will bombard you with information trying to sell themselves – caveat emptor is the rule. Britain earns millions of pounds from tourists, make sure you get good independent advice on places outside of London before you even think of visiting them . Many tourist boards have been caught lying and taken to court, and one Chief Tourist Officer of a large northern city resigned because he could no longer go on lying – his city really wasn’t worth visiting despite the tourist propaganda his department put out One seaside resort has been prosecuted for doctoring photos and the 2007/8 season ads for Scotland featured snow footage that was decades old and unlikely to match the reality, due to global warming. We wouldn’t recommend Manchester (except the Lowry), Liverpool (except for the art galleries – see our art page) despite it being city of Culture, Birmingham or anywhere in the Midlands (except for Chatworth House near Chesterfield), The Lake District ( very beautiful but too crowded unless you’re going hill walking which is excellent – if you are stay at the Gilpin Lodge and do some of the set walks, but allow two/three days minimum. ), Leeds, Bradford, Hull, Newcastle (unless you like drunkenness) South Wales except the Black country or the Gower Penninsula, Blackpool – or any seaside resort except Brighton, Portsmouth, The Isle of Wight (expensive ferry) Aberdeen, Inverness (the Lochs excepted), Lancaster or Sunderland (except Hadrian’s Wall). Some of these places are grim by any standards. If you’re a party animal only, then Manchester has a good club scene and Newcastle is good for overindulgence in alcohol and loose women, as well as streetfights – it’s where the Rolling Stones’ ‘Streetfighting Man’ comes from… A male friend was beaten up by some Geordie lasses outside a nightclub, so maybe streetfighting women as well. The Knowhere site is good for info on smaller tourist locations, but is aimed at skateboarders – its judgement on the overall character of a place is often spot-on – though generally they’re not a very helpful bunch . Posted on September 12, 2012, in Day Trips from London, Discount London, London attractions, london transport, Things to see and do, Travel Tips, Visit London. Bookmark the permalink. Leave a comment.